The Museum of Fine Arts in Boston was in need of a custom solution to help promote it’s Giclée fine art printing services. The concept of having a standalone kiosk to allow the user to preview artwork and then have them order specific pieces in a print-on-demand environment. The Museum did not want to invest in carrying an expensive inventory of items that it was not sure it would sell. By allowing the customer to select the size and framing options via the kiosk, the user would get exactly what they wanted and the museum would not have to stock the item, but instead create it for them and ship it to their home within a few weeks. LionSky worked with the museum and other consultants to focus the design of the kiosk for optimum usability. The final design included a 19″ touch screen kiosk body that the user would interact with and then a second attached 42″ monitor that would show the users browsing except for the transaction part of the process. The second monitor is located almost 12 feet away and entices other museum patrons to enjoy the process and educate them that such a service exists. Content is changeable without intervention of a programmer. By dropping properly sized JPEG images of the new piece of artwork into an external folder along with metadata text files, the museum can change the contents of the application on-the-fly. This is extremely useful for changing the look and feel of the selectable images for special exhibits and traveling shows. 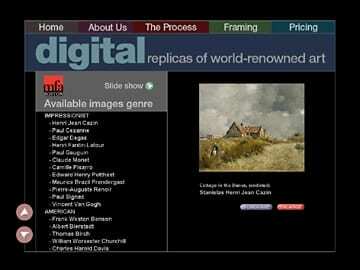 The kiosk allows the user to select from genre of art such as; Impressionists, Masters, American, Photography, Japanese and Modern/Abstract. Once a genre has been selected, the user may select from a list of artists or simply preview with a running slide show of the current images available. The user clicks on an image they like and the details of the piece are presented. Once the ordering process starts, the second monitor will only show the selected image and no information the user enters at a personal level. Selecting different frame types, displays the image framed and matted to the user and also on the second monitor. After the user decides they would like to order an image, only basic shipping information is collected. Two copies of the receipt are printed from the kiosk on thermal receipt paper. To finish the order process, the user would take the receipt to the museum store cashier and pay by cash or credit card and then the store clerk would submit their copy of the order to the print shop. Within 2 weeks time, the fine art print would arrive professionally packed and ready to open and hang on their walls. The artwork printed is color-corrected with the curators of the museum for accuracy and quality. The use of this stand-alone and re-configurable device has allowed the museum to look into other remote retail sites around the town to expand awareness and sales. Time-out screen-saver functions on the kiosk device can be used for corporate sponsorship or to promote upcoming museum events. Various software was used for the development on the project; Adobe PhotoShop, Macromedia Director & various 3rd Party Plug-Ins and Microsoft Word. Technical issues that were addressed were remote video signal broadcasting to a secondary large screen monitor and also incorporation of a thermal printing device for maximum uptime and minimal servicing of the units. Reporting systems and administrative access allow for back-end data gathering and accounting verification.